We’re headed to our first family holiday party today and I’m feeling like I could really use a little more time to prepare. I have yet to figure out how to freeze time, so I have to go with what I’ve got. I’m sure you know the feeling. Today Abby, Amelia and I are sharing some of the last-minute projects we did this year during our 9 a.m. TV segment on “Take 5 & Co.” on WZZM Channel 13. I’m posting the links and directions below so you can whip up something great before the company arrives or, better yet, make something fun with your guests. 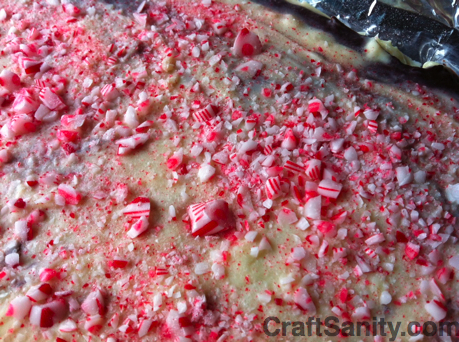 Ok, the first order of business is to make peppermint bark. I did not know how much merrier this treat can make the holidays until I finally tried this excellent recipe published over at Orangette. If you love mixing your chocolate with mint, you will LOVE this. I was going to post a tutorial for making traditional Christmas crackers, those tubular holders of treats and goodies that pop when the ends are pulled in opposite directions. However, I quickly realized that the friction strips that make the crackers to pop are difficult to come by on deadline. So the girls and I decided to go with the silent night version of this project, and simply load treats into decorated tubes and skip the noise. Truth be told, we actually prefer the quiet version. Step 1: Wrap the tube with tissue paper, leaving about 3″-4″ of tissue paper on each end of the tube to gather and tie. Tie one end of the tube closed. Step 2: Tape a band of decorative paper, wrapping paper or newsprint around the outside of the tube. Add additional embellishments as you see fit. Step 3: Fill the tube with holiday treats. For the Christmas favors, you can include candy and a small ornament. For New Years, we recommend filling the tube with a mini 2012 calendar (printable version found here), Hershey’s Kisses, a mini-2012 banner, a favorite quote, joke or words of inspiration for the coming year. We’re including the pocket of printable monthly goal lists designed by Linda Tieu for CraftSanity Magazine Issue 5. The PDF link is given in the print copy and part of the electronic file available for instant download on the left side of this page, too. Linda’s goal sheets modeled after library card card pockets are very cool, but feel free to write your own 2012 bucket list prompts, too. 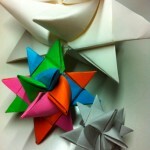 And check out this post, if you’re looking to share what’s on your to-do list for 2012. And if you think you’re too cool to glue popsicle sticks together, you may want to reconsider. While the project i just described is super simple and great for young children who know better than to splatter paint, older children and adults will probably enjoy this super-sized adult version of the project. 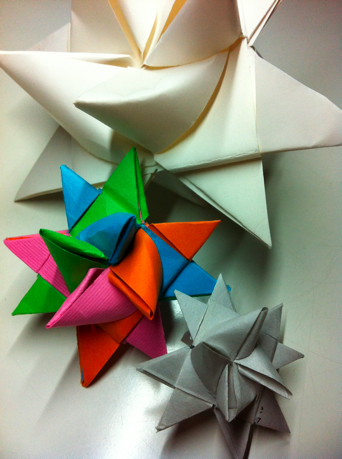 In fact, I’ve been wanting to try out the tutorial for lovely grande snowflakes for a very long time. Maybe we’ll get to that during week 2 of winter break. If you try it, please let me know how it goes. This was a late edition to the TV craft line-up. I spotted one on my friend’s tree and she kindly made me a template to share with all of you. (Thanks, Cyd!) Print the template here. And then trace it onto heavy card stock paper. Cut out the pieces, attach the legs and antlers. Then punch a hole for the hanger, attach some yarn and you’re ready to hang the reindeer on the tree or stand up as a decoration on your holiday table. 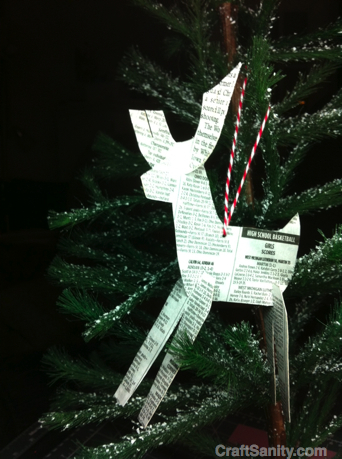 To make my newsprint reindeer, I used Mod Podge to adhere newsprint to the front and back of the card stock. I attached the newsprint to one side of the card stock, then traced my template on the side without newsprint and cut out the pieces. Then I painted Mod Podge on the unfinished side and pressed it down on newsprint before cutting out the pieces one more time. 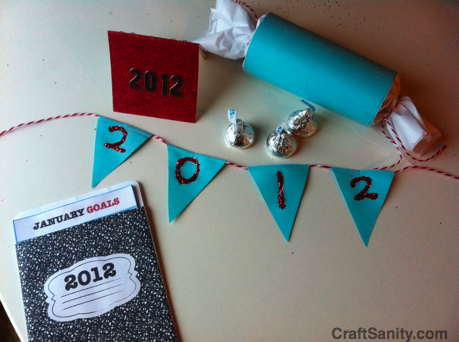 Note: You can make these out of double-sided scrapbook paper without decoupage medium, but they will not be as sturdy. I planned to tell readers about my foray into German star making, too, but that project is too long for a 4-minute segment. If you missed that tutorial, you can find it here. Alright, now I have to go whip up some more stuff for the party. 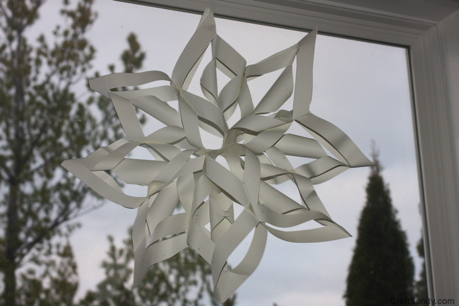 3D Paper Snowflakes These stars rank among my favorite to make. See the full tutorial here. Hih, sulla on ihan erilainen Ã¤Ã¤ni kuin oon kuvitellut! Tai siis, en oo kuvitellut mitÃ¤Ã¤n, no worries, mutta Ã¤Ã¤nesi yllÃ¤tti jotenkin. JÃ¤nnÃ¤Ã¤, miten tÃ¤mmÃ¶siÃ¤ juttuja huomaan yhtÃ¤kkiÃ¤, vaikkei tietoisesti aattele nÃ¤itÃ¤ juttuj. Some EU states have banned cross-country skiing because of the events of landslide, and the high price of search and recovery operations. The mountain has a snowboard and ski college. The old and normal walled city still exists, and there are several shops, art specialized shops, hostels and bistros. The ladies found inside the are just your normal everyday women who look great in front of the camera, mainly because their personalities shine through. Here we set high standards for the photos we show. By way of a click of your mouse you can easily see many free mature photos displayed on our site. Regizor f bun, in rest film bunicel si zic asta pentru ca nu i se potriveste deloc rolul de Alba ca Zapada la aceasta actrita din Twilight,a jucat destul de prost/fals,chiar a stricat filmul + ca nu vad la ea mare frumusete ca sa fie “O Alba ca Zapada”. Vrajitoarea a fost ok,a jucat bine (mimica,gesturile,etc) iar in rest foarte ok filmul. I enjoy reading this article. I need to learn more on this topic.. Hold responsible you for criticism this smashing info.. Anyway, I am gonna subscribe to your rss and I impose upon you transcribe spectacular articles again soon. Absolutely worthwhile info. Uh, den tror jeg bestemt at vores lille Futte vil elske Og velkommen tilbage; dine gÃƒÂ¦stebloggere har vÃƒÂ¦ret dejlige, men du har skisme vÃƒÂ¦ret savnet!!! , it obviously wasn’t just because she was Arab. She was an Arab the first two times she visited and they let her in then.Re: Cat Stevens Joke I stand corrected. They didn’t divert the plane to England just to Maine, about as far East on the East Coast as they could before shipping him back. Glad to see long vacant lots being cleaned up and replaced with buildings that will be less of an eyesore and much less dreary. Sad to see this will free up a new building in the process though. Jan06Shannon Oelrich Jen, since we’re already in the TMI zone, will you give us the lowdown on how you handle used pads when you’re out and about and need to change them? I might make the switch if I can figure out the logistics! ja teÅ¼ jestem caÅ‚ym sercem za tym Å¼eby zrobiÄ‡ drugÄ… GrecjÄ™!!! MoÅ¼e wreszcie dotarÅ‚o by tam na gÃ³rÄ™ jaka atmosfera panuje wÅ›rÃ³d zwykÅ‚ych ludzi! !Jak gÅ‚Ä™boka jest frustracja! “….Protestants are going to be of help? If only we had more Lutherans helping us out!”Have they actually met any Lutherans? As a former Lutheran and living in a solidly Lutheran country (in Scandinavia) I can tell you, Lutherans wouldn’t be caught dead “helping out” at a Catholic church, full as it is of deluded, superstitious statue whorshippers! I don’t condone this practice, nor will I participate in it. Any App, whether it’s from the App Store or the Mac App Store, I will play for in-App purchases. By doing this hack, it denies the developer of any income they otherwise could have earned. I WILL NOT have this installed to my system, because of the inherent dangers associated with it. All you require could be the existing present of one helps make your pet effective at trying to repay the credit with time totally. By way of this particular mortgage you can get over his or her troubles; there is absolutely no exclude about the using of the loan volume rendering it best assistance.